A distracting mobile phone call contributes to killing 79 in a rail crash in Spain. Ten days ago Spain suffered its worst rail crashÂ since 1944, in Santiago de Compostella. 79 passengers died. The crash took place on a new 90 km section of track between Santiago and Ourense. This is built for high-speed operation at 220 km/hr, but currently limited to 200 km/hr by signalling limitations. However, the accident was on a sharpish curve before the station, with a limit of only 80 km/hr. There is a single signal for deceleration. The magistrate investigating legal liability for the accident – there is of course another technical investigation under way – has blamed the driver for going too fast against signals and the route plan. He has not given weight to the phone call; it’s unnecessary to fix the driver’s responsibility, and perhaps he wanted to avoid the impression of blaming the unfortunate but surely innocent ticket collector and the family he was trying to help. However, common sense suggests the phone call was significant. The driver was experienced and not fatigued – he only took over at Ourense, and knew the track well. The weather was clear. There does not seem to have been any equipment failure (as opposed to design flaws). The phone call is the standout differentiating factor. There’s a mass of evidence that phone calls are distracting to car and truck drivers and responsible for a good many vehicle accidents and deaths. The USA lags well behind international practice in legislating against the use of mobile phones at the wheel. 66 countries, covering the great majority of the world’s population, have bans. Only seven US states are reported by Wikipedia as having general bans (California, Connecticut, Delaware, DC, Hawaii,Â Illinois, New Jersey). Several others have footling partial bans on learner drivers, at night, near schools and so on. Contrary to intuition and folk wisdom, hands-free phones make little difference. It’s the speech that’s distracting, not the use of one hand. For high-speed rail buffs only. The track section is designed and equipped for the latest ERMTS in-cab signalling which among many other goodies brakes the train automatically if speed limits are exceeded. That’s the system in use on the true high-speed AVE trainsets on the lines going out from Madrid to Barcelona and Seville. But the line doesn’t run all the way to Galicia, and the section to Ourense is still under construction. The short high-speed track to Ourense is a vanity regionally-driven anticipation, using Iberian gauge. The ALVIA trainsets like the one that crashed are expensive electric/diesel hybrids with dual-gauge bogies (not SFIK implicated). The manufacturers of the trainsets and the signalling between them have not been able to get the complex ERMTS software to work properly. (Source: El Pais.) For now the ALVIAs have to use the older and less capable ASFA system – which does not include automatic braking. It’s rated up to 200 km/hr, but in hindsight this looks a mistake, along with the single trackside signal to announce the drastic speed reduction. Severin Borenstein, one of the high-candlepower sources in the energy/environment community, has an excellent post on things that make sense and things that don’t for improving energy behavior in transportation.Â Just read it. I would only cavil at his easy identification of a climate charge (erroneously called a carbon tax) and a cap-and-trade scheme (which is not his main point).Â These are not Tweedledum and Tweedledee, no matter how many times economists assume the canopener of “when the market equilibrates we get the same result with either one”.Â Â Â Just one example of a Really Big Difference: to set a climate charge, the government needs to know how much greenhouse gases (GHG) are being emitted now, and the damage one more ton causes at that level, i.e., the marginal benefit of reduction over a narrow range around current conditions.Â This is not chopped liver, but consider that to set the cap for a cap-and-trade scheme the government needs to know this whole marginal benefit function for reducing discharges over a fairly wide range, and also the same function for costs of reduction, to see where they cross.Â The latter of these has been historically very difficult to construct, as it comprises mostly predictions of the cost of doing things we have never done.Â Remember in the seventies, when engineers and executives at all the car companies came to Washington and swore that the slightest messing with exhaust pollution would make all our cars stop in the middle of the street, cost a fortune, and generally cripple all of American culture.Â They probably believed it, but it doesn’t matter: they were wrong by a country mile.Â Estimates of the cost of GHG reduction will also be way too high, and one of the great advantages of the carbon charge is that it doesn’t require us to make them. Security screeners and Customs agents at airports are “domestic discretionary spending. Think about that the next time you miss your flight because the security line didn’t move. I got to the airport and hour and ten minutes early for my flight today. It was a mid-afternoon flight, not at one of the peak periods; I had a boarding pass; and I wasn’t checking a bag. So the timing should have been ample. But I almost missed the flight anyway, because the security-screening line was out the door; only two of four lanes were open. TSA screeners are “domestic discretionary spending.” So are the Customs folks whose scarcity when I landed in Dallas on a flight from Guatemala caused me to miss my connecting flight to Washington; the line, also at a non-peak period, took more than an hour. Think about that the next time someone tells you we need to work on the deficit by shrinking the size of the federal government. Footnote Could we save money and make life easier for passengers by simplifying the screening process, without losing anything on the security side? Probably. But it’s not as if the Teahadis in Congress are actually working on that problem; they’re just slashing everything in sight save defense and rural pork. While we have the rules we have, fewer screeners and fewer Customs folks at airports means more missed flights. A price worth paying? No, I don’t think so, either. understanding the rules of a common carrier, and the basics of public service. This jerk appears to lack all of the above, in addition to being personally an ignorant bigot and possibly cowardly.Â If Delta doesn’t put him on the street, I will go far out of my way if necessary to avoid using their service, and others should do the same. I don’t feature being delayed because a pilot suddenly has the idea to behave like an infant, nor fall out of the skies because he or she is crazy or detached from reality. Ilya RepinÂ´s painting of Volga boatmen is not one of serfs. High-resolution image from Wikimedia here. 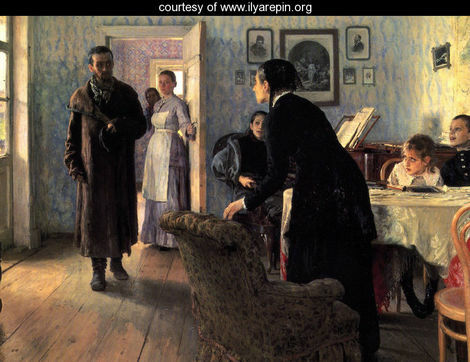 I can´t get very interested in Hayek´s obsolete polemic, but Repin´s painting is a masterpiece and worth thinking about. First of all, Brad is wrong to think it´s a picture of serfs. The painting dates from 1873; serfdom was abolished in 1861, and there´s no indication that this is a laudatory piece about the the bad old days. The subjects are burlaks; free but very poor migrant workers. In 1870, many were no doubt former serfs. The formal merits of the piece are obviously very great, but I´m unqualified to comment. The wedge-shaped composition in the letter-box canvas points off to the right, creating an impression of the vastness of the Volga and the Russian plain it flows through, and the interminable nature of the labourers´ task. The beauty of the summer light and pale blue sky contrast with the misery of the humans. What I can respond to is the psychological and social commentary. Repin was an acute observer, for my money the finest psychological painter since Rembrandt. You may find his messaging overbearing, but it´s far from trite – see this other famous picture about the disruptive return of a Siberian exile to a household that has reorganized itself without him. The Volga painting says several different things to me. 1. The burlaks are brutalized and degraded by their narrow and poverty-stricken lives. (In England, barges were hauled along canals by horses, not men.) It´s not that the road to serfdom is easy, it´s that the road from serfdom to citizenship is long and hard. Compare the parallel legacy of American slavery. Russian intellectuals tended to romanticise the peasantry; Repin is asking them to face the sordid reality. Distributing the land to Russian peasants will not instantly turn them into Athenian or Yankee citizen-farmers. Though once they had the land, they had the commonsense not to vote for Lenin, the one time they had a chance in 1917. 2. The burlaks are strongly characterised, distinct individuals, struggling to retain their dignity as human beings. They are very far from a formless, plastic mass – in fact they are so individualistic that they seem to have a hard time of pulling together in an effective way. Not surprising that revolutionaries like the Peoples´ Will signally failed to organise them politically. Repin may well be distorting reality a bit to make this point. See this actual photograph from the 1900s, showing well-coordinated and purposeful labour. But then again, people pose for photographs. 3. The painting is sometimes given the English title of ¨convict boatmen on the Volga¨, but this seems a mistake. Chains and guards are not in evidence – though the burlaks are as badly off materially as convicts. The coercion here is that of poverty, not state repression. Repin is making a straightforward plea for economic progress and justice. PS: Vaguely relevant older musings from me on the Tsarist katorga here.